A telephone is hard to come by in Peetz. There is no store downtown. In fact, there’s no downtown. There’s a post office, school, grain elevator-gas station, town office and one bar. Farmers must drive 16 miles north to Nebraska or 25 miles south to Sterling to shop for telephone equipment at Wal-Mart. But when they get it home and plug in – Shazam! – they connect to one of the smallest and most sophisticated telephone systems in the country. In the sixth building “downtown” is the Peetz Cooperative Telephone Co. Customers: 200. Employees: two – Glenna in the office and Jerry outside making repairs – who know every customer’s first name. For 15 bucks a month, Peetz residents get touch-tone service with call waiting. For a buck more they call forward. For another buck, distinctive rings for the kids’ second line. Then there’s voice mail. All-weather buried lines. Glass-fiber long distance. Everything they need to plug into the internet or hook up satellite TV or read the Denver Post On-line, which wheat grower Kurtis Hiett does several times a week. All this from two small boxes installed in May, back behind Glenna Hume’s desk. It’s a state of the art, digital switching service that hums away while Glenna cuts the year end dividend checks for the cooperative, if it’s been a good year. Sounds idyllic doesn’t it? What with deregulation and competition and big-deal telephone companies picking at us for their business? How do they do it, way up in Peetz? The answer is those same big companies, AT&T, MCI, US West and about 50 other national telephone companies that keep cash flowing into rural America. Less than 20 percent of Peetz’s annual telephone bill is paid by its 200 customers. The rest comes from the long distance carriers through various pools and access fees, a passel of subsides from all US phone customers that means great service, low rates and money back to the people in Peetz. Yet under the federal deregulation that revolutionized long distance, those subsidies are at risk. The Federal Communications Commission has proposed, but tabled, “reform” plans and “efficiencies” that Peetz residents fear could double or quadruple local phone bills. Peetz is one of 26 independent telephone companies in Colorado and one of 1500 in the country. Colorado’s smallest are Willard with 60 customers and Stoneham with 73, both in the Peetz neighborhood of northeast Colorado. The 26 companies, in aggregate, cover less than 3 percent of the state’s population. They are called “high cost” companies because their cost per line is 115 percent above the national average of $24 per line. With 198 miles of line and 20 miles to it’s most distance ranch, the Peetz co-operative can’t charge enough to pay for it’s costs. Under the initial FCC proposal, $18 billion in rural subsidies would be eliminated, including a 50 percent cut in access fees to be replaced by flat monthly fees for each business line. Subsidies that began in the 1930’s – Peetz Cooperative was started by farmers in 1918 – have helped them stay modern. Peetz, for example, got rid of party lines 15 years ago, long before US West did in rural areas. Of its 1996 revenues of $292,749 the Peetz telephone company received $157,000 from long distance telephone companies through the National Exchange Carrier Association, which redistributes the money. Another $46,000 came from instate long distance companies, about half from US West, which pays Peetz 10 cents per minute to access Peetz’ customers. “We pay them more money than they turn over to us in toll revenue,” said Guy Duncan, senior access manager for US West. By contrast, Peetz’ 200 customers paid $45,461 for local service, an average of $18 per month. Also included in the income mix last year was $19,440 from a federal “universal fund” paid by big companies, a figure projected to grow to $67,000 this year. It also got $7,622 from a Colorado High Cost Fund pool and $2,328 from a low-income Lifeline, both paid for by Colorado telephone customers. Peetz was also able to borrow more than $200,000 at 5 percent interest from the Rural Electric Association to by its new equipment. Because of the debt, no dividend was returned to its long-term customers last year, but it can amount to $200 to $300 for heavy long-distance users. Under the initial FCC proposal, $18 billion in rural subsidies would be eliminated, including a 50 percent cut in access fees to be replaced by flat monthly fees for each business line. In rural Peetz with few business, that’s a joke. “Our customers wouldn’t be able to afford telephone service if they stopped the subsidy. I’m sure bills would be over $100 a month,” said Hume. The FCC proposal met vehement protest – part based on business, part on nostalgia for the rural way of life – that has moved it back to the drawing board. No one expects subsidies to disappear. Subsidy aside, it’s still better in Peetz, where everybody knows your name. “I have some that come in to pay their bill as soon as they get it from the post office. They come right over.” said Hume. And when something goes wrong? “This is a pretty tight community. Nobody’s afraid to say anything and it’s done in a peaceful, respectable manner,” said Hiett, chairman of the nonprofit’s board. The most common problem is lightning strikes at the house box. “They’re so efficient, it doesn’t seem like we have to have anything fixed,” said Postmaster Sandra Vallier. As Peetz joins forces with other tiny telephone companies they realize that if subsidies remain, they may be so lucrative that competing telephone companies my come in, just as they are doing in Denver to lure customers away. A harbinger are the calls – through the lucrative “access” – that pour into Peetz each night. 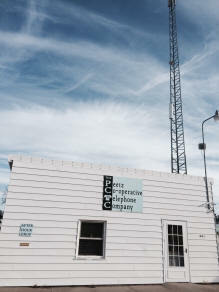 The Peetz Cooperative Telephone Company is an equal opportunity provider and employer.